Last Sunday The Management and I had a day out. I started with a leisurely 10k run (in which I got my best time so far – if you are interested in my running progress check out my running blog here ), and then we went to a National Trust property called Croome. We had seen reports that they were holding an exhibition of tapestries by Grayson Perry and I really wanted to see them. As a bonus we discovered a small exhibition in the basement called ‘Soul to Sole’ which was just delightful. I had read about Grayson Perrys tapestry series called ‘The Vanity of Small Differences’ and thought it would be interesting to be able to see them in detail, and also madness not to go when they were so local. I am not terribly familiar with his work, but I did see a post that Celia of Fig Jam and Lime Cordial did a while back and I saw things that I really liked. I know not everyone would, but I do think that art should be challenging on occasion.There was a video presentation, and a display of his sketches inn the same room. I thought the sketches were well worth having – they gave an opportunity to see how they looked both small, and in a different medium. The tapestries were all HUGE! Think back to the sort of tapestries you see in the traditional National Trust properties. I loved that he had brought fairly familiar themes up to date – and that you could spot things that were in everyday use, and also people you recognise (hello Jamie Oliver!, and I thought the ‘Madonna’ character looked very Colleen Rooney). I seem to have missed one tapestry in photos but I hope you get the idea from my, occasionally appalling, pictures. There are a couple of detail pictures just to show the texture, and also a ceramic vase that was included which I loved. The exhibition is at Croome until September, and as there are more things we would like to do there I may be back again before these go away. ‘Soul to Sole’ is an art installation using shoes as a means of describing some of the ‘souls’ connected with Croome. Sadly my pictures don’t do it justice – I was tired, and also being hurried along by The Management. There is more information about some of the shoes on a blog set up by the resident artist here. The Aristocracy would clearly have had a fairly ‘charmed’ life, not so the maids who the following shoes were attributed to – lists of tasks to be completed were embroidered(?) onto the shoe. The shoes on the right were depicting Hilda, a servant from the 1930’s, memories – I can’t imagine it would have been very much easier as a servant even then. In 1942 a local airfield becomes RAF Defford which has strong links to the house today. The shoes below were inspired by Joan Gill, who was driver to RAF Deffords CO during world war 2, and the childhood memories of Michael McDonald who was the child of an RAF captain who remembers playing in the grounds as a boy. That must have been an idyllic childhood playground. Sadly Croomes family fell on hard times and sold the estate in 1948. The house became a school for boys. I remember wearing sandshoes just like these as a child, and the shoe cubby holes were left from this era. It stayed a school until 1979 when it became a centre for Hare Krishna devotees – sorry about the picture quality. They didn’t stay too long, selling the house in 1984 to property developers, and the National Trust took control in 1996. Shoes inspired by the house martins nesting in the house. If you click on a shoe picture you should find more information. I enjoyed the exhibition, as much for it being so unexpected as the shoes being so unusual. I have enjoyed looking up some of the people involved – particularly Eleanor Coade who is the 18th century LADY who invented the artificial stone known as Coade stone. She must have been an amazing person to have achieved that at that time. I have finally managed to finish the first PJ’s for The Management, the first of the fabrics I bought on the Birmingham meet. I’m very happy with the way they look, and I know that he liked the print so I hope he will like them too. They aren’t going to be ‘easy care’ as they are a pure cotton, but they should be cool to wear should the weather here get hot at night. I got a selection of fabrics out from stash yesterday and ordered them into groups that would work together. Hopefully I will get going on things for myself very soon. I spent last weekend with my daughter who kindly allowed me to invade again. 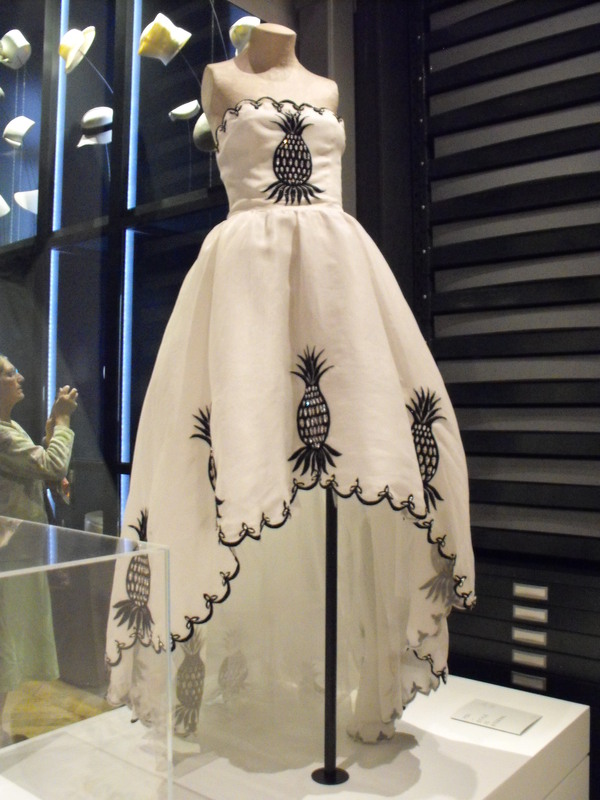 It was the last weekend of the McQueen exhibition at the V&A and I really wanted another look. Can I say now that it didn’t disappoint. Even just after 9am the queue for day tickets was already snaking its way around the block so I was very glad of my members early entry ticket. The exhibition space was more crowded this time than on my last visit but my guess is that it was going to be much worse later! 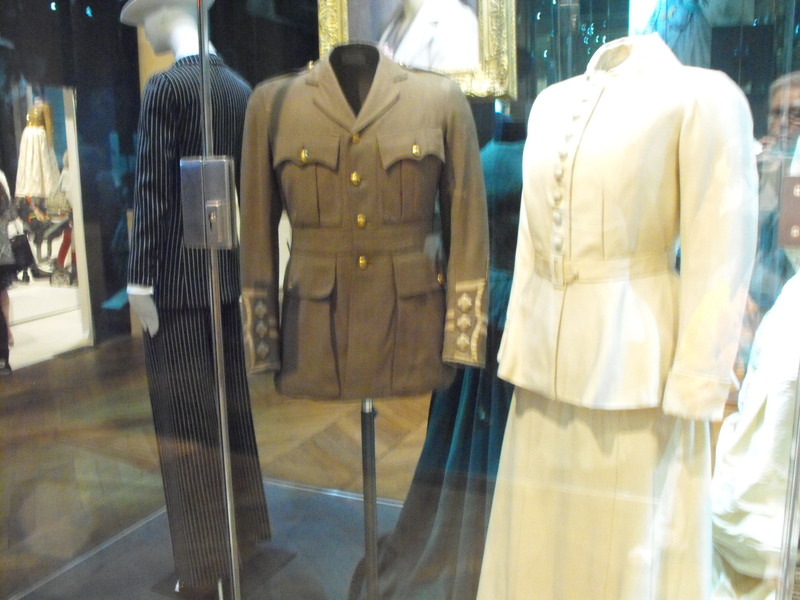 We were able to enjoy the garments all over again, check out the close detail on some of the ones I identified from the book, and retire to the members room for a tea and pastry before hitting the shoe exhibition. Whilst the shoes are fabulous I would probably not have made a trip to see them all on their own. The abiding memory will be the torture that must have been living with ‘Lotus feet’. The shoes are small beyond belief. There is some fabulous information on the V&A website which is well worth a look. Inspired by my last visit I revisited a download that had sat quietly on my computer for a very long time waiting for me to feel brave enough to tackle it. 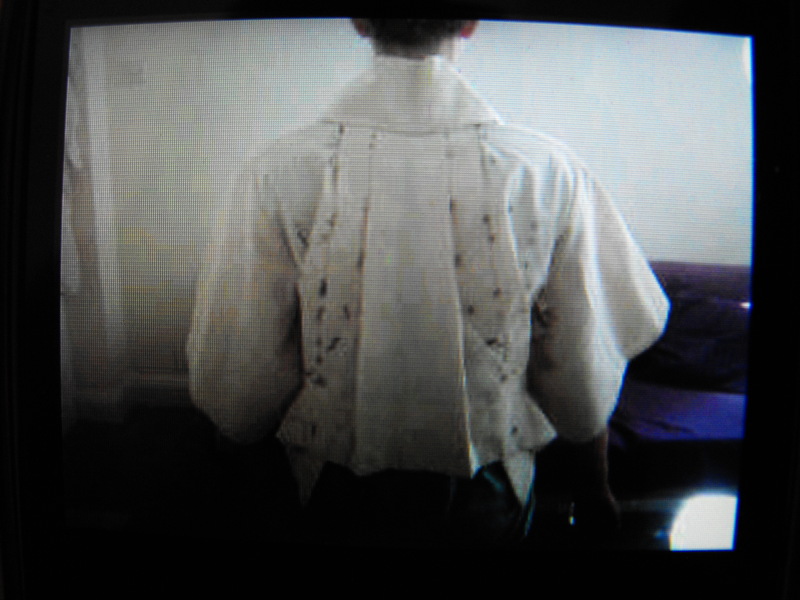 This was the McQueen kimono pattern download from Show Studio (still available – McQueen Kimono pattern. ) I didn’t feel up to pasting all the sheets together for the pattern so had it printed at a local copy shop. The lady who printed it was very puzzled by it and asked what it was! The pattern download is one size, European 40 which wouldn’t fit me but would fit my dear Jess. Regardless of whether she would like it I wanted to just try making this up so cut it in calico. 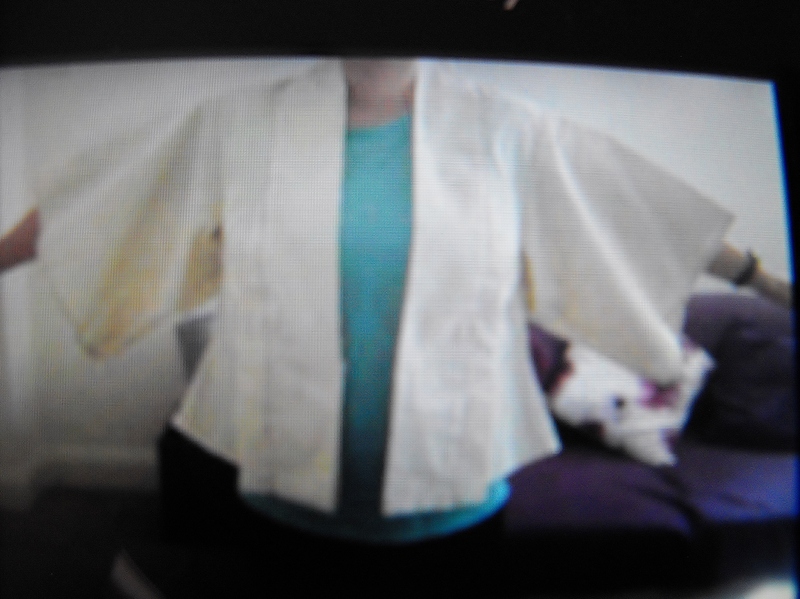 It fits into about 2.5m of 150cm wide fabric which isn’t in the download info. There are about a gazillion tailors tacks to make, not all are essential but I wouldn’t like to have missed any as this pattern is not for the faint hearted. I was delighted to find that the jacket fitted Jess perfectly – I’m not sure how I would have altered it – and she likes it! 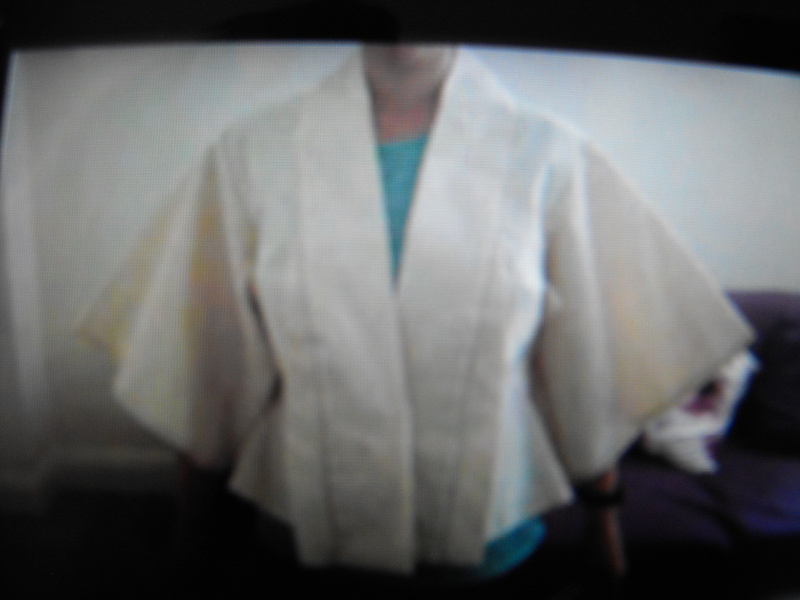 The plan now is to make it in a good but casual fabric so that she can use it through the autumn over jeans. Naturally I won’t be leaving the tailor tacks in the final version. 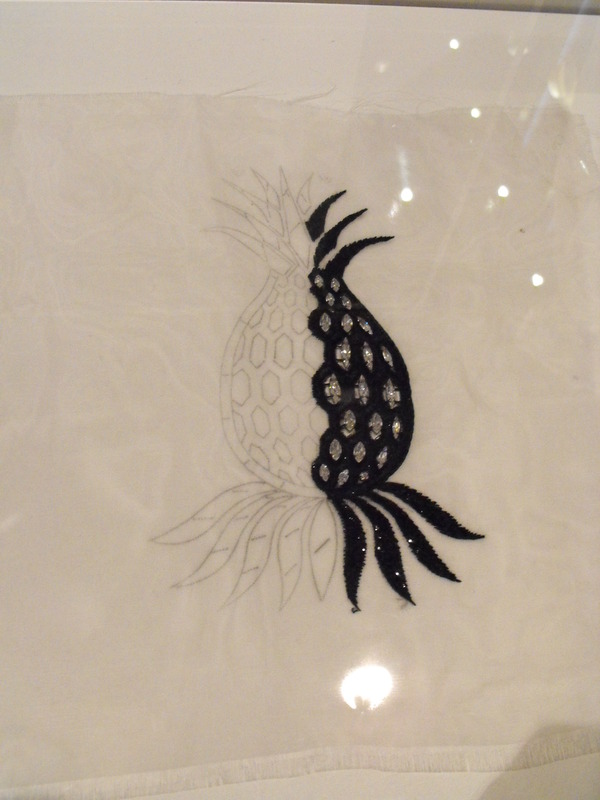 I love this design and may try adjusting the pattern to fit me – but not until I have moved this version. We will be visiting her again in a few weeks so I will show the finished version then. Off to shop the stash for 2.5m of suitable fabrics before posting samples for her to choose from. Might I suggest that before you get started you make a cup of tea/coffee and get a snack of choice – you might be here a while. This post is also going to be picture heavy. You might remember that I visited The Bowes Museum in Barnard Castle,Durham in April for their ‘Birds of Paradise’ exhibition (post and pictures here if you missed it). I only managed to catch this as I had seen mention of an upcoming Yves Saint Laurent exhibition in a magazine. What!? I thought. But that isn’t in London! Yes, Durham is in the north and they have got this absolute gem until October. Unlike the Birds of Paradise I have managed a visit right at the start of this exhibition so you have all the way through to the 25th October to arrange a visit if you like what you see. Seriously consider it if you can – Durham has plenty to offer in addition to this gem, and if you feel like getting further north Northumberland is pretty gorgeous. The tickets we bought were timed entry tickets, and I was glad to have them as the queue was building up in the foyer of the museum mid-morning and The Management reported that it got longer toward lunchtime. I think they have a winner. 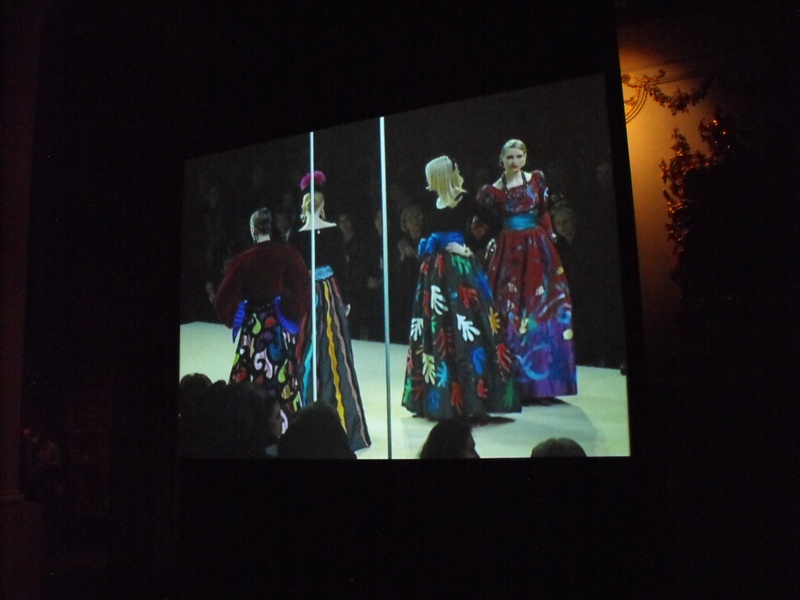 Screen showing YSL runway show – Matisse inspired gowns. Whilst on the balcony waiting for entry it was possible to watch a video (or whatever they are called these days!) of YSL runway show(s?). There was a sign showing that flash photography was not allowed but I checked with a room steward and was told it was OK to take photographs without flash. Unfortunately that means that some of the photographs are not as sharp as perhaps they could be. However, what I lost in quality I made up for in quantity. More about that later. The initial ‘crush’ in the first exhibition room quickly spread out enabling anyone to be able to look as closely as was possible at these magnificent garments. The permanent cases in The Bowes which house their own costume collections had been changed from my last visit to reflect the YSL garment shown in that particular case. Well done The Bowes. 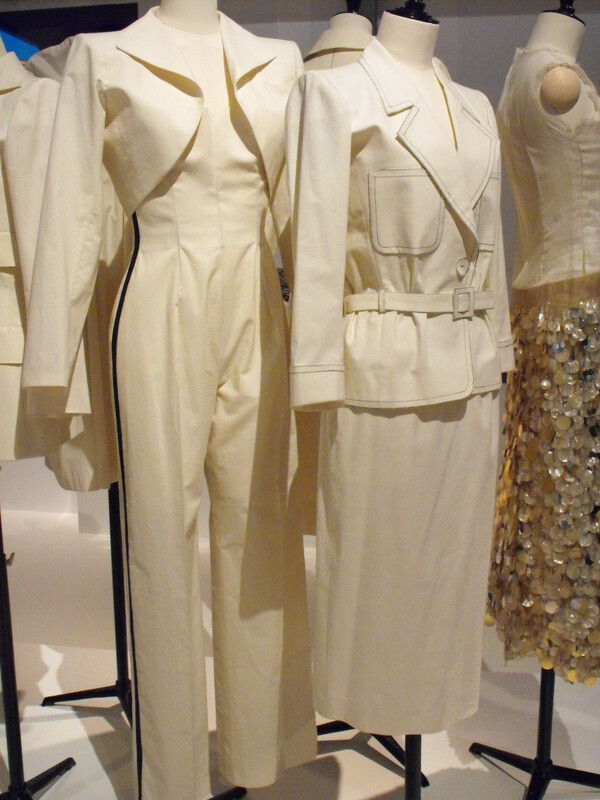 The case on the left shows tailored styles go well with the fabulous 1967 trouser suit, which I thought would not have looked out of place on a war time ‘spiv’. 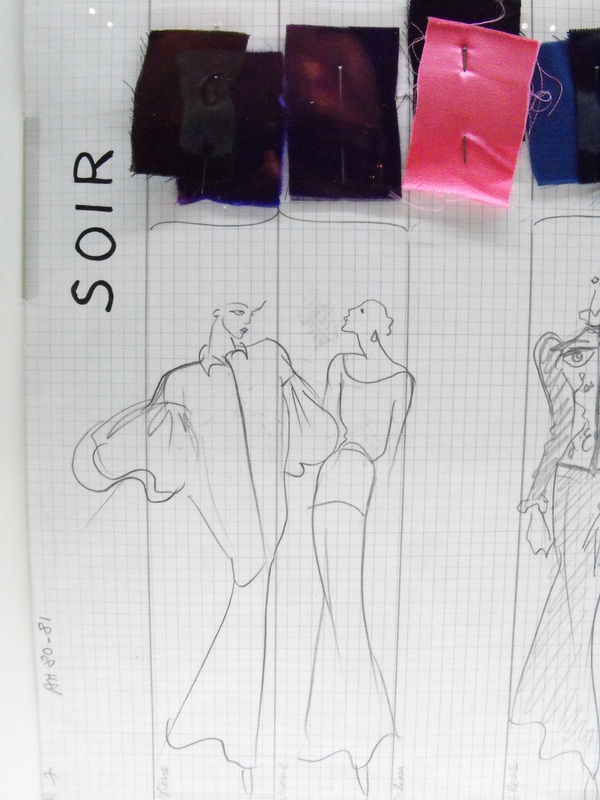 Not all of the pieces were complete garments, and I was particularly happy to be able to have a really good look at the toiles produced by a couture house. I have to admit they are streets better than my own (when I actually do make a toile) and I loved that anyone could have been able to follow them to create a garment. Maybe that’s a lesson I need to learn in my pattern cutting. The attention to detail shown by YSL is incredible. He was meticulous in his designing (apparently the drawings were done in two weeks away, twice a year, and he didn’t know until he started drawing what would appear), and was known to have things re-done if the seam was even as little as 1mm away from his requirements. 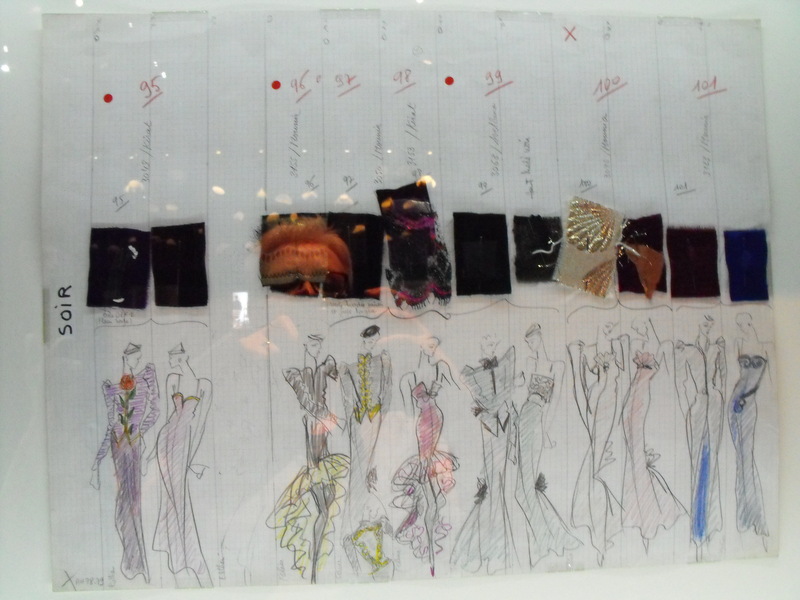 This is why haute couture is so costly. His attitude to design was not to follow ‘fashion’ but to concentrate on ‘style’. 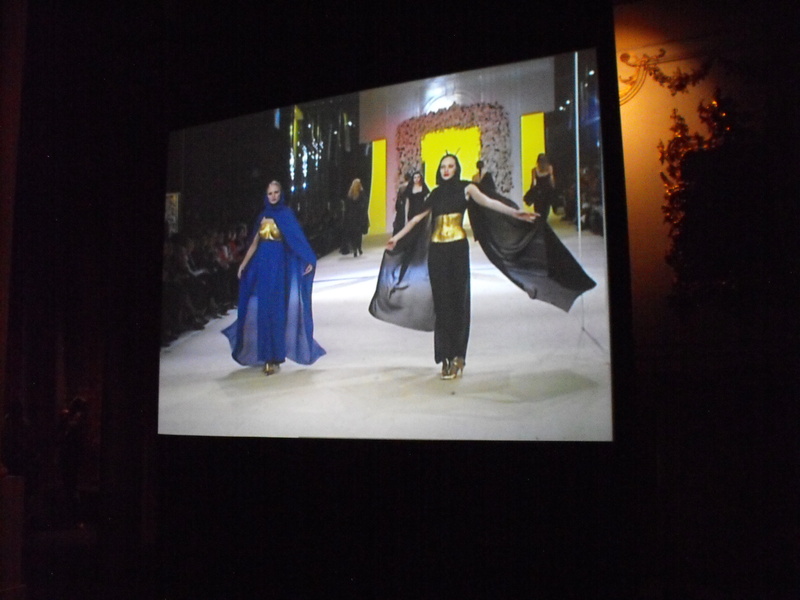 As has been quoted ‘Fashion fades but style is eternal’. I did try to take photographs of the details within the garments, we all get to see so many ‘styled’ pictures in magazines of spectacular garments but rarely do they show the tiny details involved in getting that finish. Many of the ideas are way beyond the scope of the majority of dressmakers but some were achievable with a great deal of attention to detail. 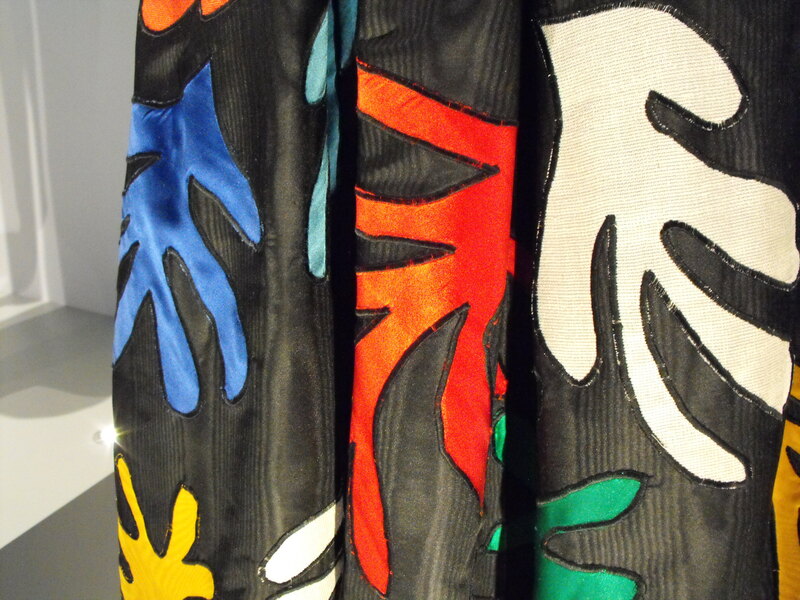 The gowns inspired by Henri Matisse were fabulously colourful, and whilst it would be incredibly time consuming to spend the time needed to do all the applique to get that amazing skirt it would be possible – just put by a month or two to make that if you want….. (and if you look very closely at the detail you can see that there are some ‘fluffy’ edges showing round some of the leaves – not machine ‘perfect’ but showing that these are truly ‘hand made’). I was fairly surprised at just how wearable so many of the garments still were despite having been designed anything up to fifty+ years ago. Many elicited gasps of admiration from some of the young ladies who were visiting who wouldn’t have been born when they were designed. There were several I would have been very happy to have taken away had I been allowed. Who am I kidding – I would have been gloriously happy just to have been allowed to hold one up against me to see how I looked. I might even have agreed to diet for one of those (and there is little chance of me actually dieting for any other reason). This jumpsuit would not have looked out of place during Jump Into June. 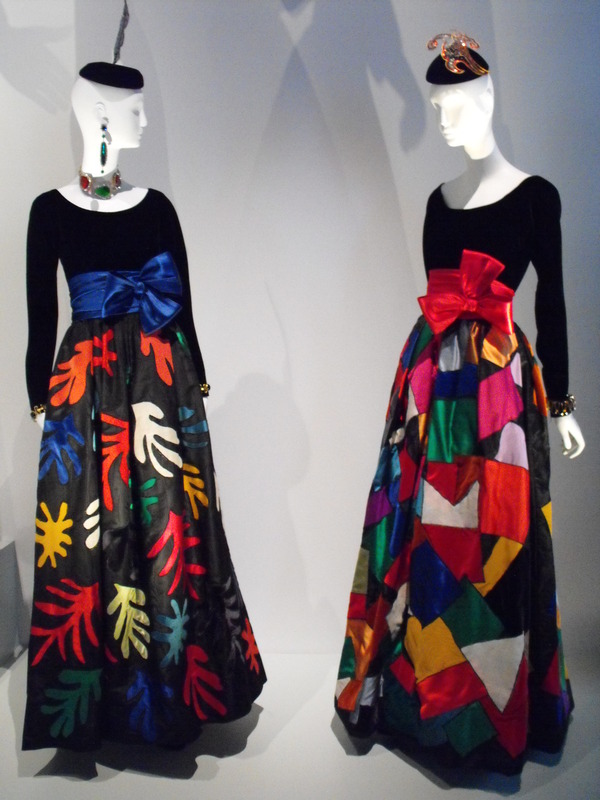 So many garments were absolutely dribble worthy that it would be almost impossible to have a favourite. 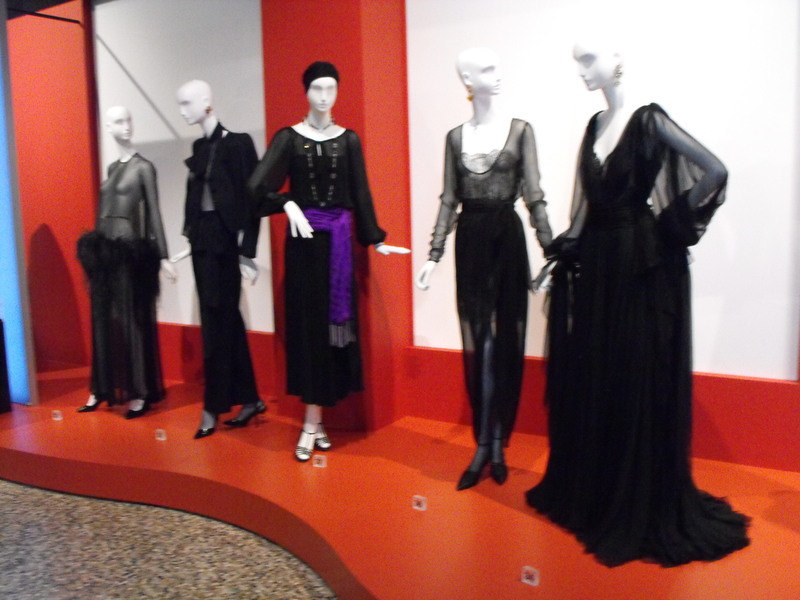 I loved one of the Transparence gowns (second from right), though clearly if I wanted to take inspiration from that it would have to be executed in something opaque, but I think my favourite is probably still the Mondrian shift dress which despite being designed in 1965 still looks incredibly fresh. 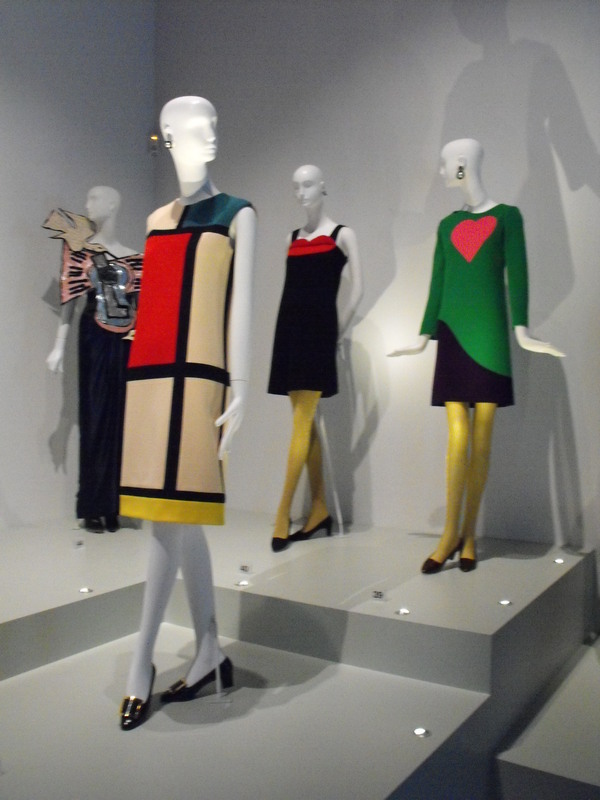 Throughout the exhibition it was possible to see where later designers had taken inspiration, and I did intend to try to show some YSL/Other designer comparisons but I haven’t had an opportunity to do that yet. I was horrified amazed to discover that I had taken over 100 pictures – clearly I couldn’t put them all on this post but if you are still curious (and perhaps aren’t able to get to Bowes to see this in person) here is the link to all of them on Flickr.